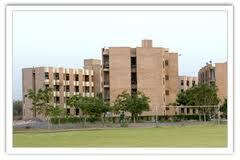 National Law University is located at Jodhpur and is an institution of national prominence. NLW was established for the advancement of learning, teaching, research and diffusion of knowledge in the field of law. It caters to the needs of the society by developing professional skills of persons intending to make a career in advocacy, judicial service, law officer / managers and legislative drafting as their profession. NLW is one of the first institutions in India to offer degrees viz. B.B.A., LL.B. (Hons. ); B.A., LL.B. (Hons. ); and B.Sc., LL.B. (Hons.) at the undergraduate level. These courses are structured in an ingenious manner which helps the students to undertake Honours courses like Business Laws, Intellectual Property Rights, Trade Related Laws & WTO, Criminal Law, Constitutional Governance, and Human Rights Studies. At the postgraduate level, the University proffers M.B.A.; LL.M. / M.B.L. ; M.B.A. in Insurance; LL.M. with specialisation in International Trade; M.A. / M.Sc. in Constitutional Governance; LL.M. IPR / M.IPR; and M.B.F. Apart from the aforesaid courses, the University also encourages scholars to undertake the Ph.D. Program. The University has also entered into various pacts with globally acclaimed universities abroad which includes student and faculty exchange programs. It is endeavouring to enter into more MOUs with national regulators, and international and national law firms of repute. BBA (Hons.) LL.B., (Hons.) provides an integrated understanding of the interrelationship of Management Studies and Law in their entirety than in specified areas. Honors in Business Administration covers a vast domain of the contemporary areas of managerial relevance and provides the students an opportunity to focus on strategies to manage business in fast-evolving global environments, with a strong emphasis on entrepreneurship, the impact of technology on commerce, managing the emerging markets of Asia and other global issues. Study of these courses will enable the students to develop a competitive edge over their counterparts in other institutions and help in taking them to the zenith of their career. Admission to all undergraduate courses is through common law admission test (CLAT) on the merit basis. All the undergraduate programmes are full time and residential. B.Sc. Technology (Hons.) is an integrated program being designed to provide extensive knowledge of contemporary technologies, having direct correlation with upcoming techno-legal disputes and IPR issues addressing the emerging trends in contemporary scholarship. Admission Criteria:- Admission through common law admission test (CLAT) on the merit basis. equivalent grade in the post-graduate examination. • Classrooms that creates learning environment. • Moot courts that helps in practicing the theory knowledge and gives a feel like real court. • Conference hall which is fully air conditioned made for conducting guest lecture other activities which can accommodate 275 people. • It also has one of the best libraries in the country having more than 15000 books and 100 national and International journals. • Halls of Residence made separately for boys and girls. Admission:- Admission in all full time Undergraduate and postgraduate programme is done through Common Law Admission Test (CLAT). This written test will be held on 7th April, 2013. • 100 students are placed in all under graduate programme. • Clifford Chance LLP, U.K.
• Simmons & Simmons, U.K.
• Herbert Smith LLP, U.K.
• D.M. Harish & Co.